Well it wasn't even a year at the old shop before we grew out of it and needed a bigger one! Keep Watching us! Only bigger and better things to come! With us constantly working it is very hard to make things for ourselves, beyond tools, at the shop. But after many a meal ate in our lap, enough was enough. Next we bent them on our DiAcro break. 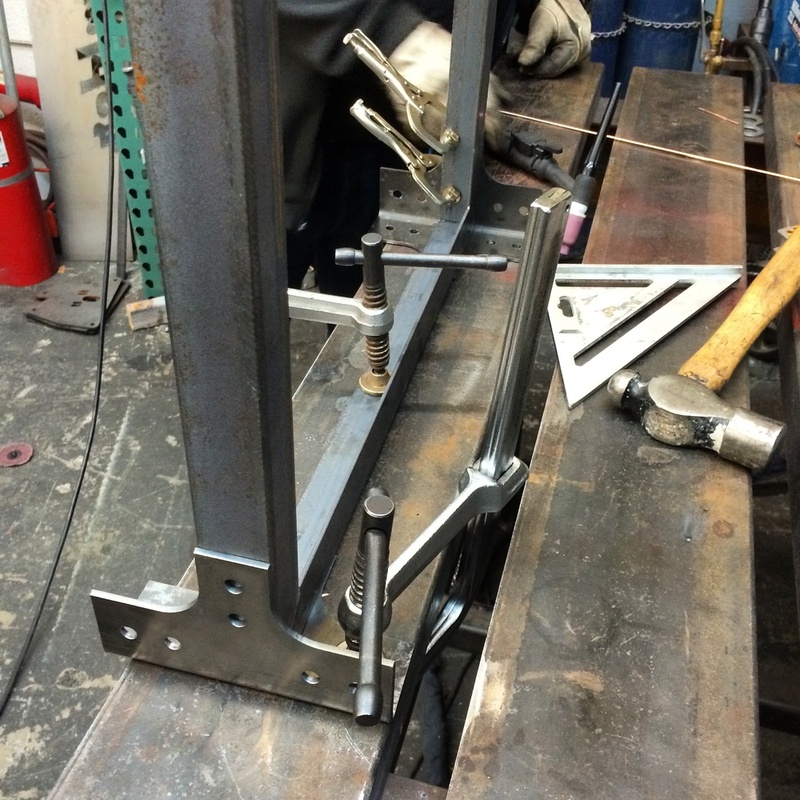 Nesto welded up some frames. Time to attach the gussets to them. While I get some trashed old boards cut up and fit into place. Nesto welds up the underside of the bottom shelf. Paying attention to details is important. We made the new bolts look old with a little patina. We just need to add some legs and weld it up! Stay tuned for the finished project! 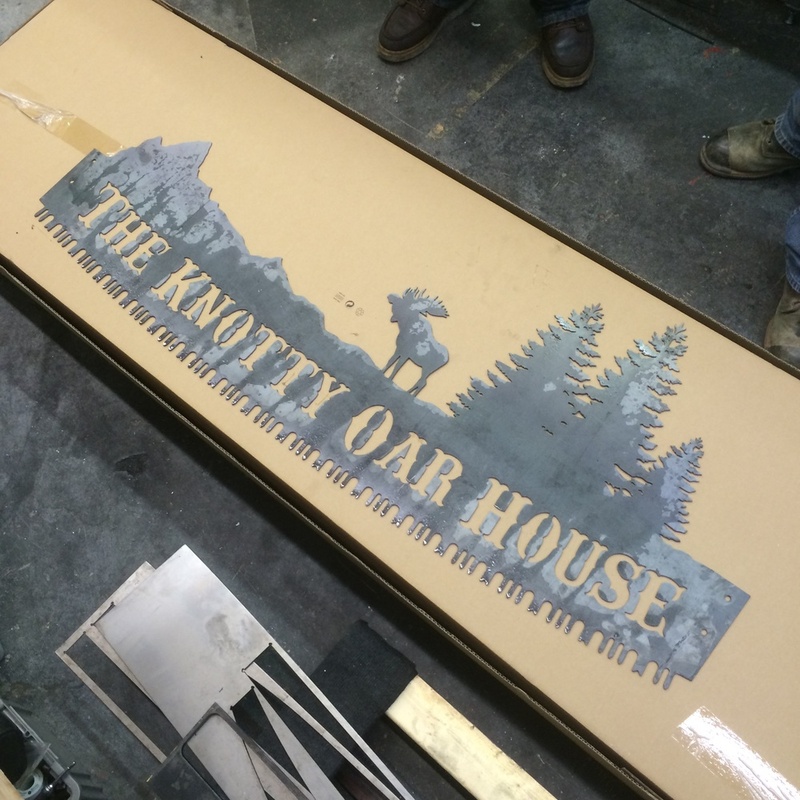 Christmas is in a few days and the plasma cutter is getting a lot of love for custom signs. Here's a couple! A mixture of brushed and patina'ed then cleared. This one got the color treatment. We are full steam a head on a variety of projects. We have a few Stainless Hoppers operating at vineyards across Northern California. And we pumping out all sorts of rad signs and architectural accents with our new Arclight Dynamics 5x10' CNC Plasma Cutter equipped with a Hypertherm Powermax85. Keep an eye out for some updates! After about 3 arduous months of filming in secret, the cats out of the bag. Jason, owner of NTK Fabrication will be one of the regular cast members on a new Reality TV Series called Red Hot Design, airing August 11th on FYI. Click on the image below for more info! The next step in watching a fabrication shop be reborn, the welding table. We wanted a table unlike others. Not the same old sheet metal top warped with heat and hammer. We wanted accuracy, rigidity, modularity, and replacability! We decided to go with 6 inch channel iron slats spaced 1.5 inches to increase rigidity and give us the ability to clamp anywhere on the table. Here's Ernesto welding the brackets on the slats. Measuring an bolting the slats in place. And here she is in action! An empty shop. A new begining. A fresh start. Here she is, only 2 weeks ago, the day I got the keys to the new headquarters of NTK Fabrication. Little by little I'm gonna stuff this place full until it's time to rent the unit next door! Keep an eye on our site for exciting updates and rad build pics. We promise not to dissappoint! Watch a shop be born. Keep an eye here for news and updates on projects as we work on them day to day. As we transition from start up to production you will begin to see our passions manifest into iron and art.